Quill Driver Books, 9781610353311, 245pp. A veteran police officer gives his thoughtful, balanced views on police shootings, racial profiling, community relations, and every other aspect of policing―and he'll change what you think about the police. From the author of the acclaimed 400 Things Cops Know, Police Craft is a thought-provoking and revelatory examination of policing in America, as seen by a working police officer. Adam Plantinga, a 17-year veteran sergeant with the San Francisco Police Department, gives an inside view of the police officer's job, from handling evidence and conducting interrogations to coping with danger, violence, and death. Not hesitating to confront controversial issues, Plantinga presents the police officer's views on police shootings, racial profiling, and relationships between police and the community―and offers reasoned proposals on what the police and the public can do better. Hard-boiled, humorous, and compassionate, Plantinga wrestles with the complexities and contradictions of a job he loves in which he witnesses so much suffering. 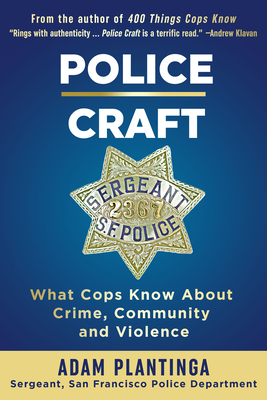 Transcending today's strident pro-cop/anti-cop rhetoric, Police Craft will give every reader a greater respect for the police and greater understanding of the job they do.